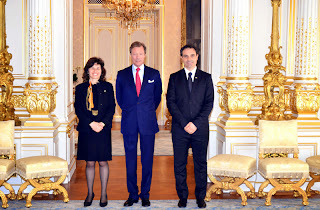 Earlier today, the Grand Duke Henri welcomed the two captain regents of San Marino, Antonella Mularoni and Denis Amici, at the palais for an audience. San Marino, an enclaved microstate on the Italian peninsula, is just over 61 squarekilometres big and has an estimated population of about 30,000 people. Its two heads of state and government are currently visiting the Grand Duchy for the opening of the Games of the Small States of Europe, which will take place tonight. Other guests at the opening ceremony include Grand Duke Henri, Grand Duchess Maria Teresa, Hereditary Grand Duke Guillaume, Hereditary Grand Duchess Stéphanie, Grand Duke Jean, Prince Albert of Monaco and Princess Nora of Liechtenstein. In case you find the time, you can watch the ceremony of the official website of the games tonight.